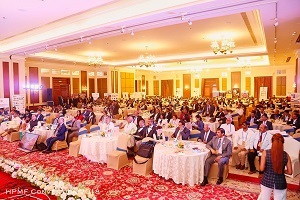 Hospitality Purchase Managers’ Forum (HPMF) celebrated its eighth anniversary along with the convention and awards from October 25-28, 2018, at The Gateway Hotel Ganges Varanasi. Conceived in 2010, HPMF is now a global organisation with over 1600 members from the hospitality purchasing fraternity. Training and development of procurement professionals, consolidated procurement, industry product standardisation, volume discounts, improved professionalism in the purchasing process, development of potential vendors, green initiatives, and corporate social responsibility are some of the key elements of HPMF. Speaking about the recently-concluded convention and awards, Nitin Nagrale, Founder, HPMF, said, “The event went off really well and all participants gave a positive feedback. Like any other event, there is always scope for improvement and what we learnt from this convention is better time management, something we’ll adopt for future events. The most satisfying aspect of the four-day event was the feedback we received from Varanasi’s local populace. They were thrilled to see an event of this scale in the city for the first time.” Over 400 delegates attended the 2018 convention. The next one is planned for the month of September in 2019, at Grand Hyatt Kochi. It will aim to showcase the culture of ancient Kerala.